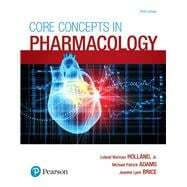 An interdisciplinary exploration of pharmacology. By its very nature, pharmacology is a challenging interdisciplinary subject that requires understanding concepts from a wide variety of the natural and applied sciences to predict drug action. For this reason, authors Holland, Adams, and Brice have organized Core Concepts in Pharmacology according to body systems and diseases, placing drugs in the context of their therapeutic use. This gives students easier access to the prerequisite anatomy, physiology, pathophysiology, and pharmacology organized in the same chapter where the drugs are discussed. The Fifth Edition continues its prototype approach of introducing, in detail, the one or two most representative drugs in each class. It also maintains a strong emphasis on safe, effective nursing care with a new chapter on preventing medication errors, features new Drug Focus boxes to cover emerging drugs, and includes many more new and updated features. Leland Norman Holland, Jr., PhD (Norm), over 20 years ago, started out like many scientists, planning for a career in basic science research. Quickly he was drawn to the field of teaching in higher medical education, where he has spent most of his career since that time. Among the areas where he has been particularly effective are preparatory programs in nursing, medicine, dentistry, pharmacy, and allied health. Dr. Holland is both an affiliate and a supporter of nursing and allied health education nationwide. He brings to the profession a depth of knowledge in biology, chemistry, and medically related subjects such as microbiology, biological chemistry, and pharmacology. Dr. Holland’s doctoral degree is in Medical Pharmacology. He is very much dedicated to the success of students and their preparation for work—life readiness. He continues to motivate students in the lifelong pursuit of learning. Michael Patrick Adams, PhD, RT(R), is an accomplished educator, author, and national speaker. The National Institute for Staff and Organizational Development in Austin, Texas, named Dr. Adams a Master Teacher. He has published two other textbooks with Pearson Publishing: Pharmacology for Nurses: A Pathophysiologic Approach and Pharmacology: Connections to Nursing Practice. Dr. Adams obtained his master’s degree in Pharmacology from Michigan State University and his Doctorate in Education at the University of South Florida. Dr. Adams was on the faculty of Lansing Community College and was Dean of Health Professions at Pasco-Hernando State College for over 15 years. He is currently Adjunct Professor of biological sciences at Pasco State College and Hillsborough Community College. Jeanine L. Brice, RN, MSN, has been a nurse for over 30 years, initially graduating from the registered nursing program at Charles County Community College. She then continued her nursing education, receiving a BS from the University of Maryland and an MSN from Bowie State University, specializing in nursing education and community health practice. Her clinical experience includes acute medical-surgical care, obstetrics, neonatology, and pediatric public health. Ms. Brice has been involved in nursing/technical health education for over 26 years, formerly holding the positions of Professor of Nursing, Assistant Dean of Nursing Programs, and Coordinator of Technical Health Programs at Pasco-Hernando Community College. She currently is employed at St. Petersburg College and Hillsborough Community College as an adjunct professor of biological/health sciences.